Explanation: What could create a huge hole in the clouds? Such a hole, likely hundreds of meters across, was photographed last month from a driveway near Mobile, Alabama, USA. Very unusual to see, hole-punch clouds like this are still the topic of meteorological speculation. 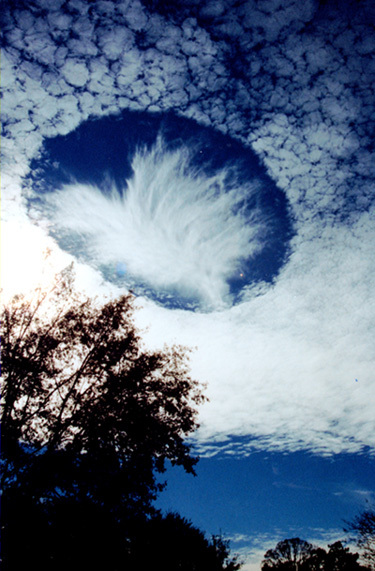 A leading hypothesis holds that the hole-punch cloud is caused by falling ice-crystals. The ice-crystals could originate in a higher cloud or be facilitated by a passing airplane exhaust. If the air has just the right temperature and moisture content, the falling crystals will absorb water from the air and grow. For this to happen, the water must be so cold that all it needs is a surface to freeze on. The moisture lost from the air increases the evaporation rate from the cloud water droplets so they dissipate to form the hole. The now heavier ice crystals continue to fall and form the more tenuous wispy cloud-like virga seen inside and just below the hole. Water and ice from the virga evaporates before they reach the ground.